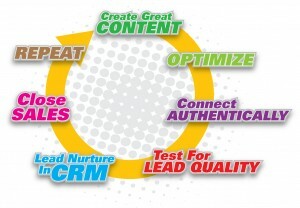 This is the second post in a CMI series on Connection Cycle Marketing (CCM). Our first article in this series offered an overview of CCM. Next up, we’ll look at one of the strategies and tactics to help with one of the first key components: Optimization. The first rule of optimization is to remember you are not optimizing a “website,” but actually optimizing the way your visitors/prospects THINK about your company and its offers. With that in mind, it’s TLA time, folks (Three Letter Acronyms)! I’ll walk you through three types of optimization and their associated tests: what they are, why you would use them and when they make sense. VBO answers the “why” of visitor behavior beyond the “what” we get from analytics. For instance, with VBO testing you can ask a visitor “Why did you exit our shopping cart?” or “Why did you choose (or not choose) to download our white paper?” Analytics only report what users did or did not do. 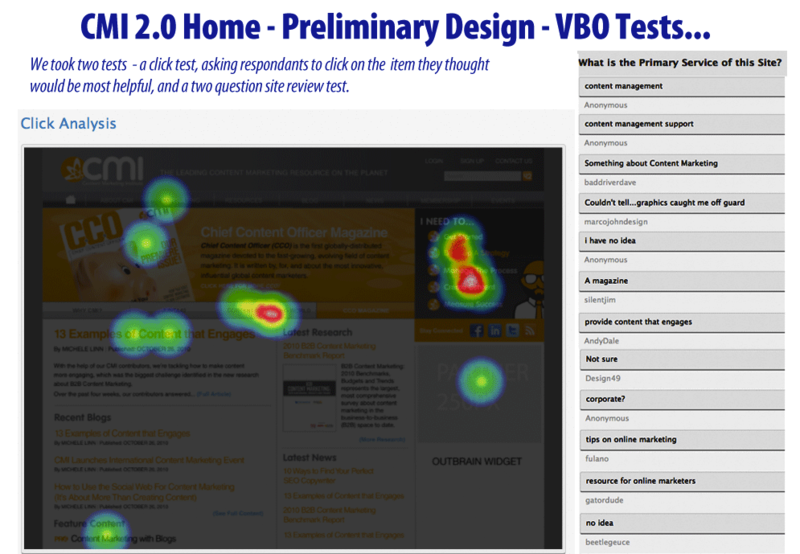 One popular method to test for VBO is to get a heat map of where people click on a page and then ask them questions that get to the “why” of their behavior. Take a look at FiveSecondTest.com. 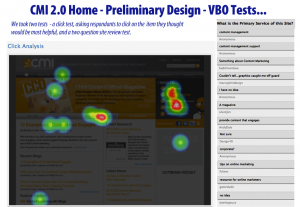 The screenshot shown is one kind of VBO test we did for CMI (click to enlarge). It provided feedback on where people tend to click on the page (heatmap at left) and what they remembered and believed the site to be about. Another way to hear what real customers think (not what “HIPPOs” think – see below) is to do an exit survey. I like 4QSurvey.com for this. Note that there are a lot of survey plug-ins and methods out there, but the 4Q people provide a robust community to help you analyze the results you get. VBO testing is ideal once your have a preliminary design for your site before it is developed. You can quickly get feedback and make changes based on feedback before expensive programming changes are required. LPO focuses on what a user does on a particular page, such as a lead form page for a B2B company or a shopping cart page for a B2C company. One tactic that works well is a simple A/B test to rotate a different page with a twist on the headline, graphic and call to action to every other visitor. Then you pick the page that “won” (i.e., resulted in the desired outcomes). An alternative to this is the multivariate test, which rotates in different combinations variables of page elements, so several versions of a page are presented. In a simpler multivariate test where you mix two headlines, with two compelling graphics and two calls to action, this would create nine versions of a page to test. Because you test more combinations, there is a greater chance you will find a version that “wins” with optimal results. Multivariate tests often result in better optimization gains, but require more visitors to the page to get actionable results. I recommend using LPO after your site is launched. These are tests you can continually run and tweak. Like LPO, CRO focuses on increasing the number of “conversions” on your website. Conversions are desired business outcomes, such as when you “convert” a visitor to a prospect when they complete a lead form. The main difference with CRO is that you usually test a series of pages instead of a single page. In essence, you are looking at the sales funnel that leads from your home page to a secondary page to an actual desired outcome page. While you can use A/B and multivariate tests for CRO, Google Analytics provides a visual way to review such sales funnels, but you only get a “what” answer with it — what visitors did (went through the funnel) or did not do (bounced away from one page), etc. This screenshot from Google Analytics (click to enlarge) is one way to consider a funnel (i.e., a series of pages leading to a goal). 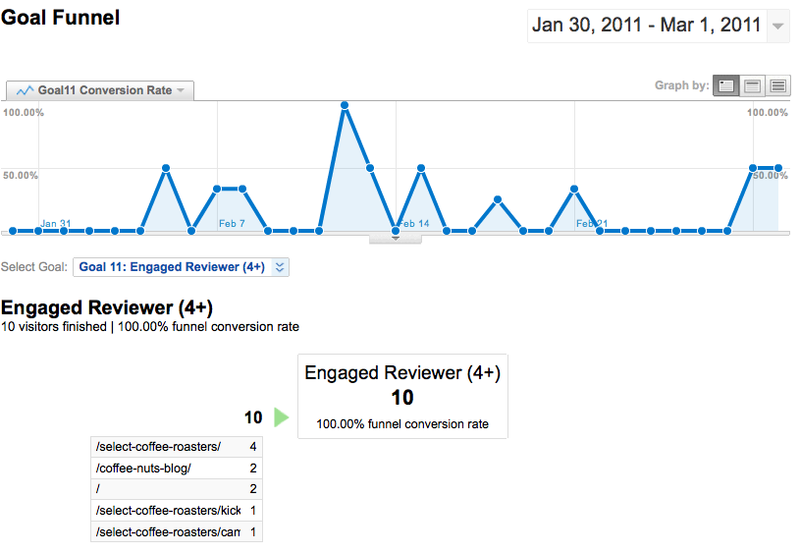 This is for the site CoffeeNutHut.com, and shows which pages best “engaged” visitors. We can study the top pages and ponder why they engaged better than those that didn’t. Often, we think of a funnel as leading to a specific outcome. For instance, in B2C that might be an ecommerce sale, or in B2B, a lead conversion. Here, we are just looking for best ways to funnel visitors into becoming “engaged” — continuing on to view three or more pages at the site. TIP: All studies show that “engaged visitors” are most likely to buy your service or products, so this is an important custom segment to follow in analytics. Like LPO, use CRO once your site has launched to continually improve your site. 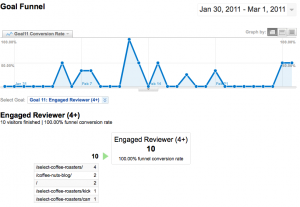 This is a great way to continually improve your site ROI. Vanquish the “brochure site” mentality. Your website is NOT done when you finish the design; it’s only DONE when you finish optimizing for desired results, then start over. While analytics are critical, aim to understand why your site visitors behave in certain ways by using tools such as VBO heat/memory tests, exit surveys and polls. You need to actually ASK your customers and prospects for this information. Often, content marketing teams default to the the “Highest Paid Person’s Opinion” (HIPPO), which is “faith based”, as in, “I really believe this will work.” Instead, reply with “let’s test that with another idea in an A/B test and see which test wins…by actually seeing how real visitors behave.” Worried about offending the HIPPO? Don’t. You are respecting their opinion by including it in the test, plus using a method of increasing site ROI that they can appreciate. I look forward to your comments and questions. In my next post on Connection Cycle Marketing, we’ll take a look at the how to get great actionable insights from Analytics while avoiding ERH — Eyes Rolling into Head syndrome. Scott Frangos (see G+), is a career MarCom professional focused on Content Marketing, Social Media, and WordPress Web Development. He loves introducing strategies and tactics to boost ROI at your websites. He also loves pizza, coffee, and Tai Chi — not necessarily in that order. Scott serves as Developer and Optimizer for CMI, and works on a variety of related projects as Founder, Chief Optimizer and Strategist at WebDirexion.com. He recently taught a class on Content Marketing with WordPress for the Langley Center for New Media, and in May of 2012, speaks on Content Marketing with G+ and WordPress Combo, at WebVisions PDX. Scott is the lead imagineer behind the popular Max-Ref Content Marketing Widgets plugin for WordPress. Link up with Scott at ScottLinkedIn.com.